We wrote this post based on a version of the guide that appeared recently and had been updated on July 31, 2017. That version lists Peter White as among three peer-reviewers. 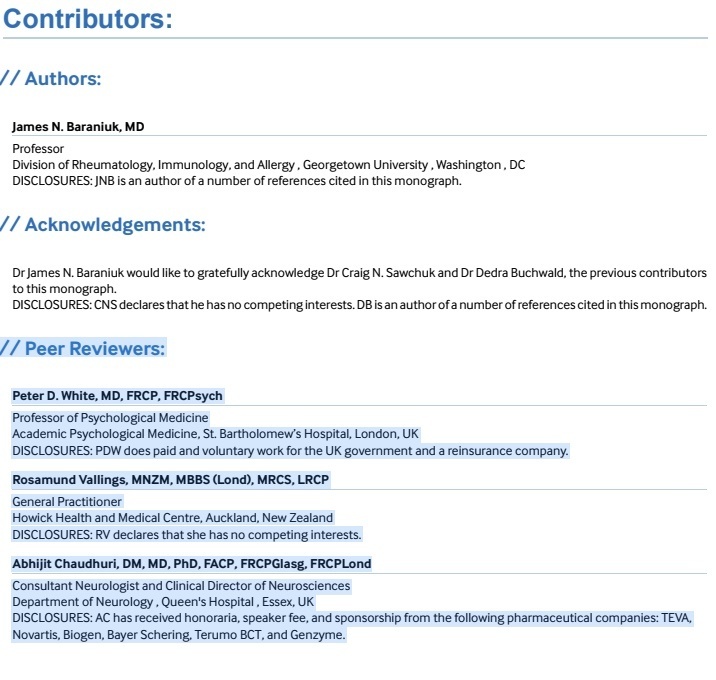 As commenters pointed out soon after the post went up, however, Peter White’s name is no longer on the peer-review list in the currently posted version of the guide, which indicates that it was updated this month. We are trying to determine when and why this change occurred. That’s the only explanation for the recent publication of a “Best Practice” guide for “chronic fatigue syndrome” (behind a paywall, unfortunately) from the BMJ Publishing Group. This thing is good. It’s very good, in fact. One bottom line at this stage for any treatment guide is the following: Would it lead a clinician to prescribe cognitive behavior therapy or graded exercise therapy for patients with ME, as opposed to those suffering from a vague fatiguing illness? The answer here is an unequivocal no. The guide doesn’t refute the PACE trial by name. It doesn’t have to. With its strong emphasis on the many physiological dysfunctions that characterize the illness, the guide represents a refutation not only of PACE itself but of the deconditioning/fear-of-exercise hypothesis—the foundational myth of the CBT/GET cult. It is hard to imagine that any organization associated with the British medical and academic establishment would have published this document just two years ago, before patients’ concerns about the PACE trial mushroomed into an international scientific scandal. Someone over at BMJ obviously understands that the field has moved beyond the simplistic and unproven claims of the biopsychosocial field. The author, Dr. James Baraniuk, is an immunologist at Georgetown University and an expert on ME/CFS as well as Gulf War Illness. (Just this month, in a study in the journal Scientific Reports, he and a colleague reported distinctive molecular patterns in the cerebrospinal fluid of chronic fatigue syndrome patients, Gulf War Illness patients, and healthy controls after a round of exercise.) The best practice guide’s peer reviewers were Rosamund Vallings (Howick Health and Medical Centre, New Zealand), Abhijit Chaudhuri (Queen’s Hospital, Essex, UK), and, surprisingly, PACE lead investigator Peter White. Recommending an article for publication does not necessarily indicate agreement with its conclusions, but Professor White still deserves some credit for apparently approving this document, since it essentially demolishes the claims he and his colleagues have made for decades. Let’s be clear: While it was The Lancet that published the first PACE results, The BMJ has also failed to distinguish itself in the debate. Just one example: When the first PACE results were published, The BMJ stated in a news report that 30 percent of the participants receiving CBT and GET had been “cured”—an obvious misinterpretation of the trial’s findings that BMJ editors have never bothered to correct. *Oxford criteria studies should not be used to determine treatment approaches to patients identified by more narrow case definitions, such as for ME, that require post-exertional malaise and other core symptoms. *Cognitive behavior therapy and graded exercise therapy are not indicated for patients with narrowly defined illness, whether or not these treatments might be indicated for patients with idiopathic chronic fatigue or fatigue arising from psychological causes. *[T]he prospect that CBT can change the illness beliefs of a patient, and that graded activity can reverse or cure CFS, is not supported by post-intervention outcome data. *There is widespread concern among CFS physicians that mandated exercise programmes can cause significant patient deterioration because of the exercise-induced musculoskeletal pain, neurocognitive impairment, weakness, and prolonged bed rest patients may require to recover from them. *[I]n routine medical practice CBT has not yielded clinically significant long-term benefits in CFS. This report puts the National Institute for Health and Care Exellence (NICE) to shame. NICE develops clinical guidelines that are widely followed in the U.K, and in other countries as well. A NICE surveillance team had the opportunity to review the same recent literature available to Dr. Baraniuk and recommended in June that the agency should make no changes to its 2007 guidance—which of course highlights CBT and GET as effective treatments. In September, after patient organizations expressed overwhelming opposition to this recommendation, NICE rejected it and announced that the 2007 guidance would instead undergo a complete overhaul. The new NICE committee that will be tasked with developing fresh guidelines should thank Dr. Baraniuk for providing them with a pretty good road map. It would be fascinating to learn the back-story of this report. What did the BMJ Publishing Group expect when Dr. Baraniuk took on this assignment? What did Professor White really think during his peer-review of a document that inflicts such serious damage on his legacy? Do Professor White and his colleagues finally recognize that the larger scientific community has rejected their flawed trial and that their long reign over this domain of research is finally coming to an end? It is too soon to tell whether Dr. Baraniuk’s report will turn out to be an inflection point in the British understanding and treatment of ME/CFS. Old prejudices (and paradigms) die hard, and the PACE-influenced U.K. medical and academic establishment is deeply entrenched. Nonetheless, it may soon become impossible for anyone to continue to argue that valid research can be based on the Oxford criteria or that “best practices” can embrace the discredited CBT/GET model. Would it be that “someone” finally comes to terms that the “false illness believes” were not in the patients heads?? Is “someone” trying to swing to the other side to create a smokescreen of some sort…or trying damage control?? Fantastic news. It is a big step forward for us here in the UK. It will be interesting to see if the SMC responds to this and how the PACE appologists as a whole respond. It sounds like it does not even leave Esther Crawley wiggle room with her unsupported claim that ME/CFS is a biomedical condition but that it can be cured by CBT and GET. I agree with the author putting “CFS” and “ME” into the category of a physiological illness, where the CBT is unproven and GET can be harmful, because of the post-exercise sickness symptoms. Then, on the other hand, you have chronic fatigue of unknown reason, idiopathic chronic fatigue or undiagnosed chronic fatigue. Whether CBT or GET, because it may be psychological, is unknown. Some put CFS with ICF saying those may be psychological. Then put ME in the physiological. But I think it’s more appropriate, as this study does, put CFS with ME. We all may be trying to say the same thing, just differing on the definition or name to use to make the distinction. I like the way this paper makes the distinction (as you report on it here). Let’s hope that this is an indication of how the future rewritten NICE guidelines for ME/CFS might pan out. That’s intriguing. I wonder what’s going on? Now we need Prof Baraniauk on the review panel. Are there enough UK physicians with the correct knowledge to lead the review? We don’t want 3 psychiatrists again. Are BPS lobby a step ahead and putting CFS into the MUS (medically unexplained symptoms) category with the intention of holding onto anyone that cannot get an ME diagnosis. Peter White did a presentation years ago where he admitted that his profession was responsible for the confusion, as they had accepted the way the meanings of ME and CFS had diverged from their original purpose. I take this as Dr. White “saw the writing on the wall” and made some effort to leave traces that protect his PERSONAL legacy. We don’t want or need ANY psychiatrists on the review panel. Nothing against psychiatrists per se, just don’t see the relevance of them being on a panel reviewing treatment options for what is clearly a physical condition. I’m sure there must be at least 3 physicians that could qualify. I suspect it’s possibly more a case of will they feel safe enough to put themselves forward given the likely backlash from certain quarters desperate to save face. I have just read the treatment on this journal and I have to say I am concerned. Rehabilitation with the term Body awareness therapy fills me with the collywobbles and the fact it is coached by a physiotherapist. The paper Ref  is https://www.ncbi.nlm.nih.gov/pubmed/26306716 The second treatment is CBT. Multidisciplinary rehabilitation treatment is more effective at reducing long-term fatigue severity than CBT in patients with CFS. Body awareness therapy, coached by a physiotherapist, aims to establish an increased awareness and consciousness of healthy bodily symptoms and their relation to physical function, psychological wellbeing, and social interaction. Unlike conventional CBT, immediate feedback is provided. The intent is to increase self-awareness and self-acceptance, reduce reactivity to passing thoughts and emotions, and improve the ability to make adaptive choices. In patients who have been chronically ill, mindfulness skills have a positive effect on depression, mood, and activity level. Normalisation of the sleep/wake rhythm begins by stopping daytime napping, and proceeds to improving the quality of sleep through relaxation therapy. Occupational therapists and social workers supervise social reintegration by making plans to return to work or school, and to increase social activities. Instruction is provided to prevent relapse. Amazing, thanks for reporting on this! The UK is starting to look to the science!! Yeah. I posted a pdf version on our closed Facebook page locally. this is at the back! Yes, I too was wondering whether guides like this and the future NICE guidelines, if appropriately modified, will be of any help for people with the assorted MUS diagnosises. I have a long standing ME/CFS diagnosis where as a neighbour has a recent diagnosis of a functional neurological condition. It may be even if we escape the psychosocial model of ME/CFS sidetrack here in the UK over the next few years, there will still be a significant number of people trapped with unhelpful and misleading ‘psychiatric’ diagnoses being excluded from appropriate medical interventions. It’s another amazing case where the results cry out that his theory is wrong, so he just moves the goalposts and carries on! “Graded exercise therapy (GET) has been advocated for CFS, on the basis that CFS is maintained by both the avoidance of activity and deconditioning. Two systematic reviews have concluded that there is high quality evidence of efficacy of GET in adult outpatients. Yet, many patients can drop out of GET or not even start it. This may be related to a *fear of exercise, which is reported by the majority of CFS patients*. Thus he starts off by offering up the fact that members of M.E self help groups ‘believe’ [on the evidence] that exercise may be harmful, as his starting FACT that most M.E patients are *afraid* of exercise! He actually finds that ‘CFS’ patients do perform worse in the exercise test, AND that it’s not due to deconditioning, even though they are matched with controls and less scared than them, and had no pre test anxiety the previous day: yet, instead of concluding this is the illness *actually being measured*, he just says they only ‘perceive’ they are fatigued: which is back where we started! Then he finishes by saying, essentially, they ought to drop the fear of exercise mainstay of their theory, and replace it with the idea that we are ill because we believe what the help groups tell us, instead of what he tells us! By this reckoning, M.E could not have occurred before the charities were set up to help those suffering from it!!! It’s also a surprise to see that Chaudhuri was a reviewer on this new guidance too, because I waited years to get a referral to his clinic, only to have him ridicule my attempts to explain my illness to him in barely any time while only being allowed to ‘choose three symptoms’. Then he wrote a scornful letter to my GP, with instructions that it wasn’t to be shown to me even though I have a legal right to see it. You might say, I found his attitude less than helpful. Thank you for the important work! thanks for the heads up on this Joan. It took me a lot of years to figure out that attempting to push through got me into more and more trouble, as opposed to learning my own body signals to pause, rest or shift, that allowed me to do more things and spend more time in between crashes. I wish I had figured this out earlier in my illness although I expect there was time where it would not have made any difference. I have yet to meet a patient who did not tend to push through as a standard MO. This is fantastic news! These guidelines MUST be presented to the NICE review. It would be nice to have open peer review, and then we would have a better idea. Thanks and well done for saving a copy! Great progress. Something to point medics to while the 3 year NICE review grinds along. Barb Robinson – a personal comment regarding a posting elsewhere. acknowledged and re issued AGAIN without PW as a named Peer Reviewer? Either he did, or he did not? responsible for? Has the text within changed? BMJ,……. “best practice guide” three versions and counting…….? “Best Practice’ but not as we know it Jim” …..
After the recent CDC changes, several good articles, and now BMJ best practice guide, I am cautiously optimistic that things are finally changing for ME/CFS. But being burned many times in the past let’s add _very_ cautiously optimistic. Thank you Mr. Tuller for keeping on top of things. This article is wonderful news and shows that progress is being made but like you Tina I will be watching out for the chameleon like technique use by the BPS group as they change and shift to accommodate and slither out of trouble whilst holding on to power. I expect the sections on therapies have most likely been entered by PW thus accounting for his taking part as a reviewer. all. Naps in ME most often enhance night time sleep rather than damage it. school, and to increase social activities. Instruction is provided to prevent relapse. This quote gives Esther a get out clause I think she has used similar wording recently. I am just skim reading it now and will try to read properly. I have to say on reading so far I still have many concerns. Yes, the guide does point out there is research coming out that shows metabolic dysfunction and graded exercise can make many worse, which on the surface is some progress. Yet the treatment recommendations are still focused on rehabilitation and CBT. Also the document rightly says Oxford and NICE criteria should not be used but still wrongly recommends Fukuda as a valid criteria. It also criticises ICC criteria. Also says the CFS definitions require PEM. Yet fails (purposely?) to point out that PEM is not essential under the Fukuda CFS defintion for a CFS diagnosis. Are they still wanting to include studies using Fukuda which we know uses mixed patient cohorts making the results dubious. A lot of the assertions use studies using Oxford and Fukuda criteria as evidence for them, even cites PACE as a reference for a claim. To me, the BPS lot have their finger prints all over the document and I am not surprised until this month Peter White was listed as one of the peer reviewers. It’s a mish mash of a guide in my opinion. Often reviewers may make comments on what changes they would like. I wondered from the start if there were any changes recommended by reviewers or editors. Also its possible that PDWs comments were minimised by the other two reviewers. This is a step but what needs to be updated is UpToDate. That is what all the doctors I know look up and send me info from. It is still recommending CBT and GET. Therefore, my own sister, a doctor, is still telling me to do that even after informing her of newer research. They don’t look up chronic fatigue syndrome at the CDC, BMJ, nor IOM report and probably don’t even know of the existence of that info, and likely aren’t going to look there even if told. Actual doctors in practice are going to ignore all the other information until UpToDate gets updated. Also, now that White has been removed form the list of peer-reviewers, is the responsibility for these biopsychosocial assumptions being transferred to the other authors? Do they agree with this? I agree definition/criteria as opposed to the name is key. As pem in Fukuda is not mandatory, some diagnosed with Fukuda CFS will have something different – idiopathic chronic fatigue – to all those who have post exertional symptom flare up. My take always is many of those diagnosed with CFS will have the same illness as those whose symptoms map onto ME defiintions, but crucially not all. Very interesting and certainly a step in the right direction…but as it states in the last paragraph …..’the die hard, and PACE influenced UK medical and academic establishment is deeply entrenched’…..so I won’t hold my breath…..just yet! UpToDate relies on publications from high-impact journals (they’re silly enough to think that citation count of articles in the journal generally is a meaningful indicator of the likely article quality of each and every article published in it), so this BMJ publication should improve the UpToDate article. Well, improve except where it just rewords bad ideas. It is good to see progress. It is bad when they try to sneak it in without a decent explanation of the change. What? Do they think nobody pays attention? All we see is something that isn’t really cleanly separated – and too many egos which should be repudiated are being cossetted instead. Without removal of the bad science, the future science is tainted. Some researchers will still believe things that haven’t been thoroughly debunked publicly. To say nothing of the ‘scientists’ who remain at their posts, able to do more damage. May I please have some good science that tells me what to do to remove a disease that has lasted almost three decades? And some accountability for the monies spent on bad science? Science isn’t that delicate. It can take having the bad weeded out. I dare say they do. Like I said I have nothing against psychiatrists per se. I just don’t see the relevance of having psychiatrists on the review panel for drawing up guide lines on treatments for a physical illness.